Stuffed with Dahi and fresh mint leaves the Paneer Crunchy is itself a fresh and delightful recipe for snacks. 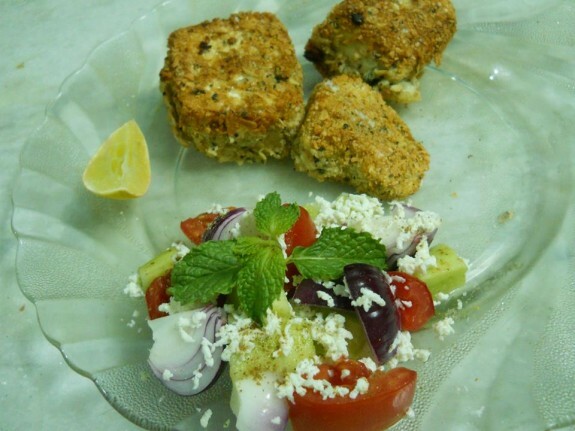 Presenting this with Greek fresh vegetables salad gives a delicious tangy delicious dish. 1. Cut the Paneer in large dices. 2. Slice half portion (not full slice) of each Piece of Paneer from the middle. 3. Hang the curd for 30 mins in a muslin cloth to remove all the water from it. 4. In a bowl mix 3-4 tbsp curd, 3 tsp corn flour, ½ tsp lemon juice, 4-5 chopped mint leaves, salt and sugar to taste. Mix them well so that no lump is formed in the mixture to make the stuffing. 5. In a bowl make a smooth paste with the 2-3 tbsp flour and little water. 6. Put the papad into the mixer and make a crispy small pieces of papad. 7. Now take each lightly half sliced paneer pieces and add little amount of curd and mint stuffing into it. Repeat the same process for all the other Paneer Pieces. 8. Heat oil in a pan. Now take one stuffed paneer piece and dip it first into the corn flour paste to make layer of corn flour first and then coat it with the crispy papad to make a layer .The layer of papad will make the paneer crunchy. Now add this paneer piece in the oil to fry. 9. Fry all the Paneer pieces in the same way until its light brown in colour. 10. Serve it with Greek Salad. 1. coarsely chop tomato, cucumber, onion and capsicum. 2. Whisk olive oil, lemon juice, vinegar, garlic, oregano together until blended. Add salt and ground black pepper. 3. Combine onion, tomato, cucumber, capsicum, olives in a bowl. Toss with the dressing and sprinkle cheese over it. 4. Your Greek Salad is ready to serve.